Medeleine Solomon is director of policy and community programs for the Tobacco Technical Assistance Consortium in the Rollins School of Public Health. Courtesy photo. Growing up in the 1950s, Madeleine Solomon still recalls the music box proudly displayed upon her parent's coffee table. As tinkling notes played, doors would swing open to dispense — surprise! — cigarettes. At the time, she notes, cigarettes were simply a fact of family life; more than 40 percent of Americans smoked. 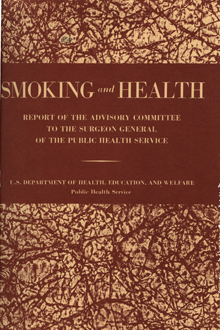 But that began to change with the release of the 1964 Surgeon General's Report on Smoking and Health — the first federal document that had ever linked smoking tobacco to lung cancer and heart disease. This year marks the 50th anniversary of that landmark report, which Solomon credits for kick-starting decades of social change around smoking. For the past 30 years, Solomon's career has taken her to the front lines of that battle as a public health educator, advocate and lobbyist. Today, Solomon serves as director of policy and community programs for the Tobacco Technical Assistance Consortium (TTAC) within the Emory Centers for Training and Technical Assistance at Rollins School of Public Health, where she works with state health departments, foundations and coalitions across the nation — and recently China — to develop programs and policy interventions to help reduce smoking. What's the significance of this anniversary of the Surgeon General's Report? It allows us to see how far we've come in the last 50 years and where we need to be. Before the report, cigarettes were considered attractive, accessible, cheap and easy. We're looking at how to change that, to make it less acceptable. And there has been a shift; it's no longer seen as glamorous. Smokers are not the villains here; they've been hooked by an industry that's profiting from their addiction. How has the culture of smoking in the United States changed? Just in the numbers of people who smoke there's been huge progress. In 1964, about 42 percent of the U.S. population smoked; now that's about 18 percent, lowest among people with a college education, highest among those with less than a high school education. We've identified disparities, socio-economic demographics, that show where we need to do more work. What's been most successful in creating change? We know that smoke-free air policies change the social climate. It's also effective to change the price of tobacco: when the cost goes up, demand goes down. In New York, for example, a pack of cigarettes costs well over $12, but there are disparities between the states. The price of a pack in Georgia is around $5.30. The U.S. Department of Housing and Urban Development has also begun promoting smoke-free subsidized housing, which is very powerful, and we're looking at the advertisement and placement of tobacco products in the retail environment to reduce the allure for young people. We're doing our best to make it less acceptable, affordable and attractive. That's how you change the social norms. How did tobacco become the focus of your life's work? I've always been very involved in public health, interested in social justice issues and attracted to the idea of making lives better for large numbers of people. The problem with tobacco — which kills over 440,000 people a year — is that it's the only products that kills its consumers. That was interesting to me as a public health problem and a social justice issue. For the most part, those being killed are the poor, the uneducated and the less fortunate. I got my masters degree in public health while working for the American Heart Association (AHA) as their lobbyist and became very interested in the issues around smoking back before it was popular, when we were being told that we were meddling in people's rights. How did you come to be so deeply involved in smoking policy? In the mid-1990s, the Robert Wood Johnson Foundation started a huge program to find the best way to reduce tobacco use through policy change. I was hired to work as a grant officer for that program through the American Medical Association. We worked with state coalitions dedicated to reducing tobacco use. After six years, I went back to the AHA to work on national tobacco policy. How did that lead you to Emory? I was facilitating a workshop and started chatting with someone from Emory. It's been wonderful to work for something I believe in at a university dedicated to nurturing young people and giving the knowledge, tools and inspiration to do good public health work. What's the scope of your work here? We work with the Centers for Disease Control and Prevention (CDC) on projects and with states that need extra assistance. People request training from us and we deliver it. This month, I'll be traveling to Louisiana and South Dakota to work on projects. Next month, it's Nebraska. We have a contract with the CDC to work with the Tobacco Control Network, tobacco program managers from all 50 states, the District of Columbia and the U.S. territories. I was also tapped to work with Emory’s GlobalHealth Institute, which received a five-year grant from the Bill and Melinda Gates Foundation to work in China, the largest producer of cigarettes in the world. With 300 million smokers, their knowledge of tobacco as a public health problem is about where [the United States was] in the 1950s. But as a result of this program, five cities have passed smoke-free laws, improving the lives of 21 million people. Is there a personal element to your work? I often start trainings by talking about how much I miss my father, a smoker with heart disease who didn't live to meet my husband or my daughter. The work I do has a very personal meaning to me, as it does to almost everyone touched by losing a parent or grandparent, who understands the full measure of that loss upon the next generation, who won't have the older generation to learn from.